At Southern Off-Road, the only thing you need is a vision. We will effectively take your vision and morph it into a living and breathtaking custom Jeep. We are the exclusive customization provider for Palmer Dodge Jeep RAM in Roswell, Ga.
Venture off the well-beaten path and take the road less traveled with a versatile, fully-customized Jeep from Palmer Custom Jeeps by Southern Off-Road Specialists. Palmer Custom Jeeps by Southern Off Road Specialists is a unique concept forged out of sheer passion for helping customers and a passion for Jeeps. We bring decades of experience and expertise to each custom Jeep build. Unlike other companies, our Jeeps are designed to provide you with off-road capability as well as on-road drivability. 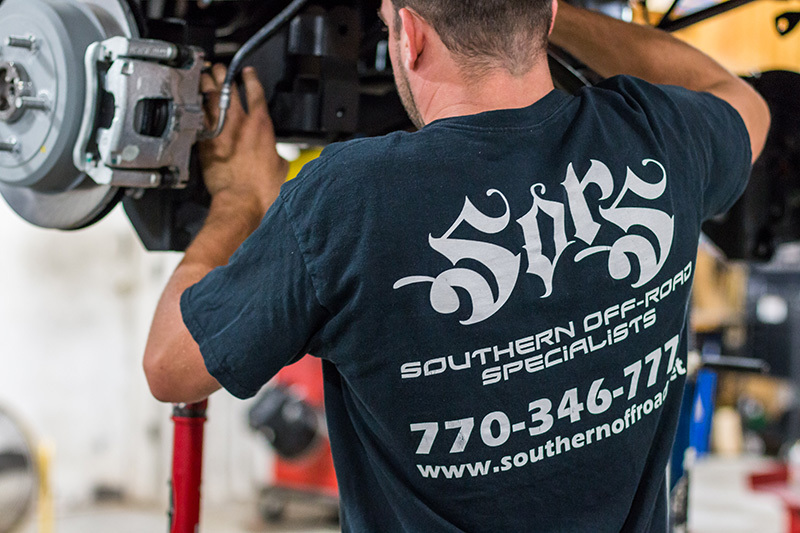 The partnership between Southern Off Road Specialists and Palmer Dodge Jeep Ram was connection based off one thing – awesome, customized Jeeps. Our experts are passionate about creating one-of-a-kind Jeeps that will fit flawlessly into your lifestyle. No matter if you’re going to cruise the city streets or venture into off-roading trails, you can trust the Palmer Custom Jeeps crew to make your new Jeep exactly what you want. Read on to meet the team that is just as passionate as you are.